Airmax PS20 System, 115V, 200' 3/8" EasySet Airline | Fountain City Art Ctr. Airmax PS20 System, 115V 200' 3/8" EasySet Weighted Airline. Airmax PS20 Aeration Systems are the top choice for pond and lake owners everywhere to efficiently and effectively deliver much needed oxygen and circulation to ponds and lakes. Aeration creates a healthy ecosystem resulting in improved water clarity and fish health. 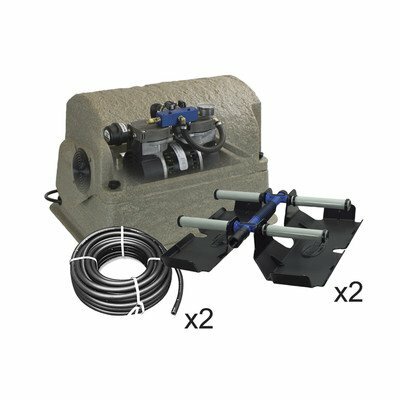 The PS20 PondSeries System aerates up to 1/2 Acre @ 6-9' deep, up to 1 acre @ 9-12' deep and up to 2 acres @ 12-21' deep. The composite cabinet with built-in rain guard, 6' power cord, air filter protects the whisper-quiet SilentAir 1/2 HP Rocking Piston Compressor with a duel manifold. PS20 produces 4.7 Max CFM with 4.1 or 2.1 running amps. 2-Year Warranty. Includes (2) ProAir 4 Diffuser Plates. If you have any questions about this product by Airmax Aeration & Fountains, contact us by completing and submitting the form below. If you are looking for a specif part number, please include it with your message. GreenClean Granular Algaecide - 8 lbs (Case of 4) - String Algae Control for Koi Pond, Fountain, Waterfall, Water Features on Contact. EPA Registered. Safe for Fish, Plants, Pets and Wildlife.